Casa do Peixe Azul (House of the Blue Fish) is a single storey, detached villa, completed in 2004. It enjoys an elevated position in a tranquil, rural location nestling in the hills close to the village of Moncarapacho, 25kms east of Faro. The area is known for its citrus groves – Laranjeiro, the nearby hamlet, means ‘orange tree’. The house has its own private pool (10m*5m), is well equipped and furnished to a high standard. There is space to relax and take in sunshine and shade around the villa, in the gardens and next to the pool. Also, a large roof terrace allows you to take in views of the peaceful surrounding countryside and the sea on the horizon. The nearest beach at Fuseta is a short drive, 5kms away. Inside the villa. : There are 4 bedrooms - 2 have a double bed, a third has two single beds. In addition, a converted study acts as a 4th bedroom - the room is a little smaller, but it has it has a double bed, wardrobe and a chest of drawers. Wi-fi is included in the cost of rental. The kitchen is equipped with a gas hob, electric fan oven, dishwasher, microwave, washing machine, fridge freezer, a fridge for drinks plus a generous array of other accessories. The living room has seating for 9 people and has a flat screen TV (including local and some international programmes), DVD player and a Bose iPod dock. A separate adjoining dining area leads onto an outside barbecue terrace where one can dine or simply enjoy the evening sun. There are 2 bathrooms – one with a shower, the other with a bath with a shower attachment. Each has a WC. The villa is air conditioned and can be heated if necessary during winter (logs are at extra cost). Maid service and linen change is weekly, but additional cleaning can be arranged and is chargeable locally. Smoking is discouraged inside the villa but welcome on the terraces. Other notes. : Outside, the 10m*5m freshwater swimming pool is adjoined by a lawned garden overlooking the fields behind the villa. It benefits from an external shower and there is plenty of space to relax on sunloungers. We supply some beach towels for guests. A covered patio area offers shelter from the sun close to the pool, while the roof top terrace is ideal for sunlovers as well as providing a panoramic vista. A double car port at the front of the property enables parking for 2 cars in the shade. Children and infants are very welcome. We provide a travel cot, a high chair and a baby bouncer for very little ones. In addition we have a few books, puzzles and games. The Eastern Algarve. : The Eastern Algarve has its own distinct, picturesque character with the countryside dotted with citrus, almond and carob trees. Moncarapacho, the local village, has a 16th century church at its heart yet has small supermarkets, restaurants, a selection of local café/bars, shops, banks etc. The area’s beaches are absolutely superb. Many are based on sandbanks, or ilhas, which can be accessed by boat, or in one case, a miniature train. These boast kilometres of golden sand with both decent facilities and plenty of space to escape the crowds. In addition the nearby towns of Tavira, Olhão and Estói are all worth a visit, while the proximity of Spain means that a day trip is little effort. The Rio Formosa Natural Park is a must for birdwatchers. A 9 hole golf course is very close, while a number of 18 hole courses are a reasonable drive away. Air conditioning is included in the rental cost. 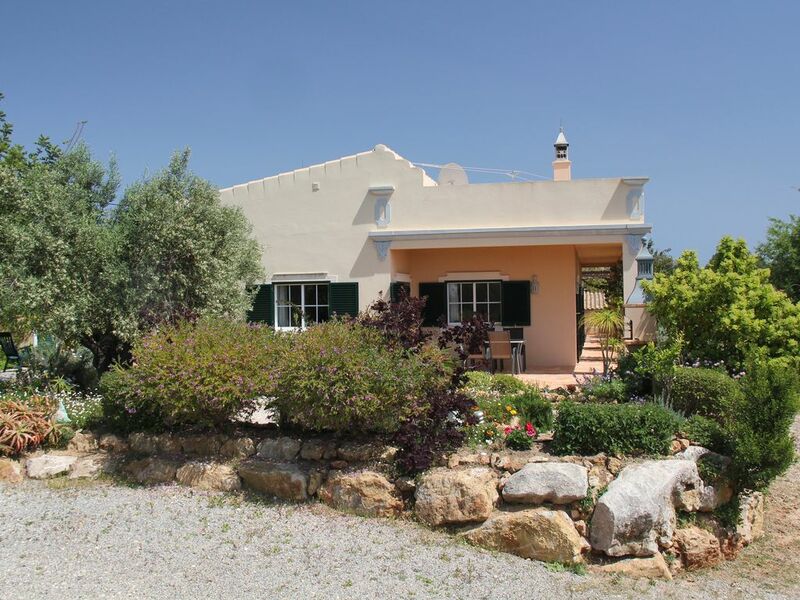 The villa is in a peaceful, rural location and there are lovely views of the countryside and the sea beyond. There is one immediate neighbour and a handful of other houses in the area so that despite the general tranquillity, the villa is not isolated. A wonderfully situated and maintained villa which is greatly equipped with a pool and nice facilities. It is ideally located in a very quiet place which, however, makes it easy to get to supermarkets and the sea. One has the choice to use the villa as a springboard for nice trips and/or to just enjoy its location and especially the wonderful pool! The nice, warm weather can be ideally enjoyed there! A great stay - highly recommended!! We went to Portugal with our 2 children and grandson .The villa was amazing, the pool gorgeous and we all had a wonderful time. It was very hot, although we went in June, so the pool cooled us down. My grandson said the best bit of his holiday was the pool- he went swimming every day. A wonderful house that is fully equipped with everything you could need, the whole house is really well maintained and very clean. It is in a lovely rural area that is very quiet, we were really taken with the whole place. Beautiful villa which is very well furnished and equipped with as much kitchen equipment as my house at home. Everything is clean and new with excellent oven and hob in the kitchen. The location was perfect for us - quiet and secluded yet only ten minutes drive from the coast and lovely villages. And only 30 minutes from the airport! We loved the terrace which wrapped around the villa giving shade or sun as needed (as well as views over the countryside to the sea) and the pool area was a real suntrap with loungers, large table and chairs. The owner responded to my email enquiries immediately and the description on the website was accurate. In fact the reality was better than expected - I have already recommended this villa to a friend! Nous sommes partie à 8 dans cette jolie villa! La villa est bien située, dans un petit chemin tranquille. La villa est très bien équipé que de soit la cuisine ou le reste c'est top!! Je conseille vivement! Propriété de qualité! Merci pour cet agréable séjour!! Beautiful villa, simply and tastefully decorated, with everything you need: quiet and natural surroundings; short distance from the sea by car; an excellent swimming pool; cozy corners outside. Lives up to the description on the website. Localized arguably in the best part of the Algarve (equidistant between Olhão and Tavira). Accessible and very friendly owner. Prompt on-site support by lovable Jennie if needed. Recommend it anytime. The villa is located in the lovely Eastern Algarve, 2kms from the village of Moncarapacho with its shops, restaurants and cafes. Nearby Olhão has a number of large supermarkets and fish restaurants and the regional capital of Faro, with its international airport, is not far away. The area’s beautiful, long, sandy beaches are easily accessible while a 9-hole golf course is close to Moncarapacho. Note too that the border with Spain is only around 30-40 minutes’ drive away. Changeovers are on a Saturday, although we can often be more flexible outside the peak season. Guests are asked to vacate the villa by 10.00 on the morning of departure. If booked directly via the website, we ask for the total rental at the time of booking, plus a €350 security deposit.